Stimulating Puzzle Toys: The perfect entertainment for Labradoodles to alleviate boredom and separation anxiety. Do You Own a Mischievous Labradoodle Puppy or Adult? Providing Your Dog with a Number of Toys Can Keep Them out of Mischief. If you own a Labradoodle you would be well aware of their active, non-stop personalities. The Labradoodle breed gains it’s intelligence from the Poodle parent, and their overly friendly, active personality is inherited from the Labrador parent. While walking your dog and keeping he or she active is important, stimulating puzzle toys will help to keep your furry friend out of mischief at home and help with mental health. If a Labradoodle becomes bored they will not hesitate to create their own entertainment. This entertainment may be in the form of something sinister such as chasing a lizard around the yard, or something their owner will not be happy to return home from work to such as a chewed up pair of showers or worse, a sofa that is missing half of the cushioning. The Labradoodle is classified as a retriever dog. This means that they enjoy retrieving and working to keep busy. Keeping your puppy or dog healthy involves ensuring they are active and their intelligence is being put to good use. Chew toys, puzzle toys and tug toys are among the most favorable by the Labradoodle breed. If you work during the day, a puzzle treat toy will help keep your dog stimulated while you are not there to. 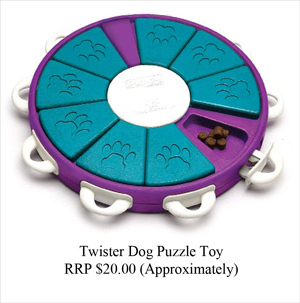 Puzzle treat toys work by entertaining your dog by luring them in to collect a special treat once they have worked out how to get the treat out. 1 What Toys do Labradoodles Love? What Toys do Labradoodles Love? Puzzle toys work to occupy your Labradoodles mind rather than enhance their physical fitness. The intelligence Labradoodles inherit from their Poodle parent makes them enjoy all problem solving toys. 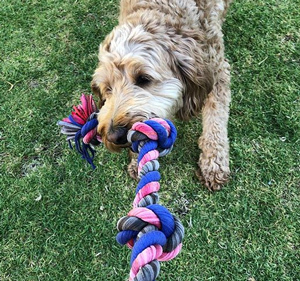 When choosing a puzzle toy for your Labradoodle ensure the toy will be challenging enough for your dog. A toy that is easily solved will lead to your dog becoming bored and loose interest in the toy. Most dog breeds love to chew and Labradoodles are no exception. Labradoodles can be strong meaning the chew toy you select should be durable quality. Having a number of different chew toys for your Labradoodle gives them choice and will decrease boredom. Tug toys requires the owner to pull against the Labradoodle. This works the Labradoodle’s physical fitness and ensures the dogs teeth and jaw is strong. Tug toys allow the Labradoodle to share bonding time with the owner. If you happen to have two Labradoodle dogs, a tug toy is a great toy for them to play with together. Retriever toys or fetch toys are a great way to bond with your Labradoodle. Being an active breed they love to run and also love to please their owner. A fetch toy can allow them to do both of these things. Fetch toys are generally basic balls, plastic squeak bones or similar so it is important to use a fetch toy that is tough enough to survive the strength of a Labradoodle. Below you can find the top toys for your Labradoodle. If you have a medium or standard Labradoodle, you will need to purchase the larger sized toys available, while a miniature Labradoodle will require smaller, lighter weight toys. The Kong Treat Toy has been around for many years and is often a dogs best friend. 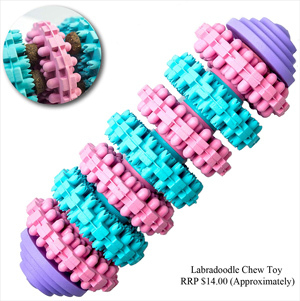 Not only will this interactive toy keep your Labradoodle occupied; if they are going through a teething stage, it will relieve any teething troubles they are feeling. The objective of this toy is for the Labradoodle to attempt to eat the treats that the owner hides inside. 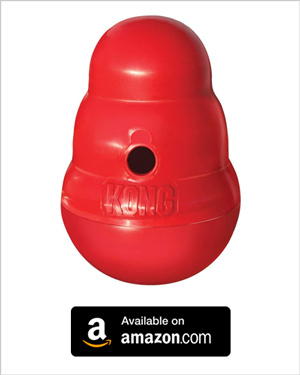 The bottom of the Kong twists off where the owner can stash the dogs favorite treats, or just some dog biscuits. While the Kong is primarily a puzzle treat toy, it can also be thrown in hopes to be retrieved by your Labradoodle. The shape of the Kong means that it will bounce and turn making your Labradoodle need to think to catch it successfully in their mouth. This proudly American made dog toy, is bound to keep your Labradoodle occupied and out of mischief for quite some time. The Kong is made entirely from rubber meaning that it can be hand washed after use. On Amazon, one Large Kong toy (suitable for a medium or standard Labradoodle) can be purchased for approximately $20.00. 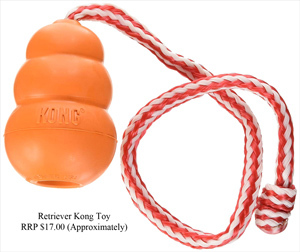 View current price of Kong Toy here. The IQ Treat Toy requires the dog to roll it or throw it to release the treats or biscuits. Made from non-toxic plastic, this dog toy is durable, safe and can be easily cleaned. This dog ball differs in the way it cleans the dogs teeth with it’s unique patterned outer. While your dog is being both physically and mentally active playing with the IQ Treat Ball, their teeth are being well looked after. Using an IQ treat toy will ensure your dog is only rewarded if they have been active. This type of toy is great because it can be retrieved, chewed and is a puzzle with treats as a reward. Toys like this can easily become a Labradoodles favorite. This type of interactive dog toy is less likely to be thrown aside like their stuffed toy might have been previously. The IQ Treat Ball Toy is said to withstand the rough play of a Labradoodle. These treat ball toys currently retail on Amazon for $13.00. View current price of the IQ Treat Toy here. 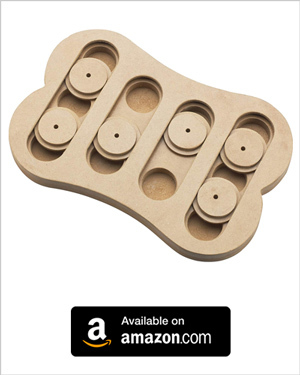 Unlike the previous toys mentioned that were designed from plastic, the Interactive Seek a Treat Toy is created from durable wood. This toy will ensure that the Labradoodle is mentally solving the puzzle to receive the prize which can be any kind of dog treat. These type of puzzle treat toys will strengthen your Labradoodles cognitive ability and keep them from mischief making. The Interactive Seek a Treat Toy can be used by a number of puppies at once or alternatively a two pack can be purchased together. The sliding disks can be moved back and forth to reveal treats hidden by the owner. 10 different treats can be hidden at any given time for your Labradoodle to be rewarded with. The sturdy wood material used to create the Interactive Seek a Treat Toy is hard for a Labradoodle to destroy, and in the circumstance they do, each of these toys comes with an 18 month money back guarantee. If you own one Labradoodle, a 12 inch Seek a Treat Toy can be currently purchased for $15.00. Buy your Labradoodle an Interactive Seek a Treat Toy here. The Slow Feeder Treat Toy will provide your Labradoodle with mental stimulation to keep he or she out of trouble. Treats can be hidden within the open/close balls which then the Labradoodle can attempt to open with the mouth or paws to retrieve the treat. 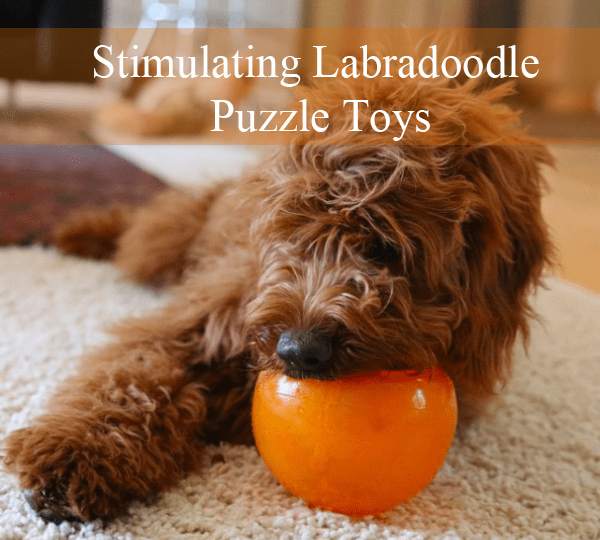 The lids of each ball easily flip opened and closed, so this means the Labradoodle will need to practice their paw/eye coordination in order to retrieve the treat. These type of toys can even be used to feed the dog from if they have a tenancy to rush their meals. The slow feeder treat toys will control how quickly the Labradoodle can eat their meals. 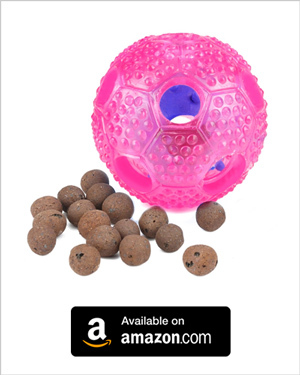 If you find that your Labradoodle becomes easily bored or rushes their meals, the slow feeder treat toy might be perfect for them. This five hole treat toy that is made of plastic is durable and will improve your dog’s cognitive abilities. Currently retailing on Amazon for $19.00, these toys really are one size fits all, they can even be gifted to cats who enjoy puzzle treat toys as well. Find out more about the Slow Feeder Treat Toy here. The Fun Feeder Treat Toy is similar to a dog bowl although has a curly line within the inside to prevent the dog from rushing their food. This ensures they will need to use their tongue and mouth to maneuver the biscuits to a place in which they can consume them. This dog bowl is recommend by veterinarians across the globe as it reduces dogs suffering bloating and ingestion. The plastic used to create this toy is chemical free and extremely durable even for the roughest of Labradoodles. While many owners choose to put biscuits in the fun feeder, small bite sized treats can also be used in this bowl. The Labradoodle Fun Feeder comes in a number of colors and designs as well as sizes. When selecting a sized feeder bowl for your doodle, consider how many cups of biscuits you give them daily and then purchase the correct size accordingly. 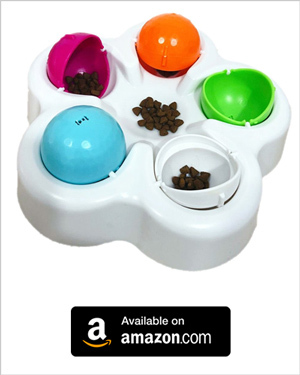 On Amazon, the Treat Fun Feeder Toy can be purchased for $10.00. 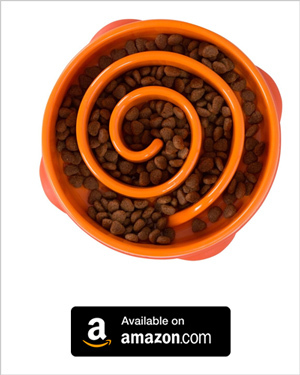 Buy your very own fun feeder bowl for your furry friend here. If you’re weighing up which Labradoodle puzzle treat toy will be perfect for your fury friend, our advise is purchase a number of different toys. Providing your puppy with a number of toys that they can retrieve, chew, tug and solve will ensure they stay far away from any mischief that can be caused.